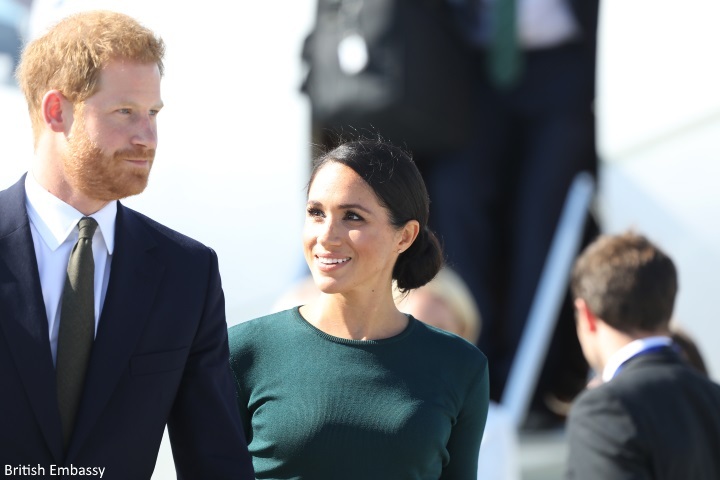 Mad About Meghan: The Duchess of Sussex in Green Givenchy for Dublin Arrival! The Duchess of Sussex in Green Givenchy for Dublin Arrival! The Duke and Duchess of Sussex landed at Dublin airport shortly after 5 pm for their first official overseas visit as a married couple. The couple are visiting at the request of Her Majesty's Government. 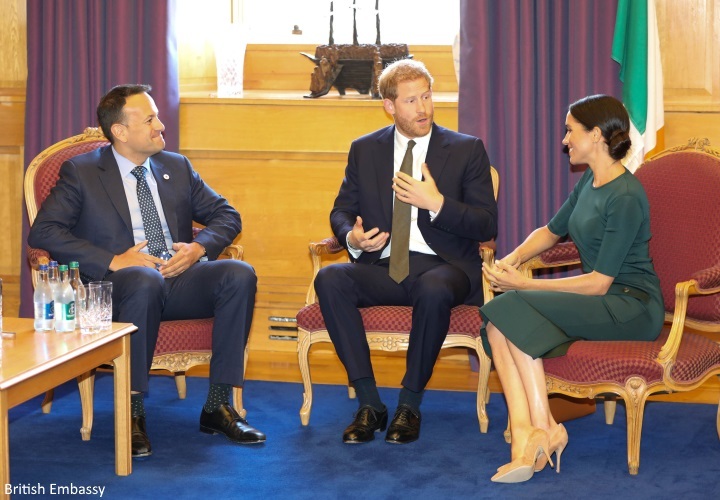 Ahead of the visit Kensington Palace said: "They are looking forward to learning more about Ireland's history and experiencing its rich culture, as well as meeting the people who are shaping the country's future. 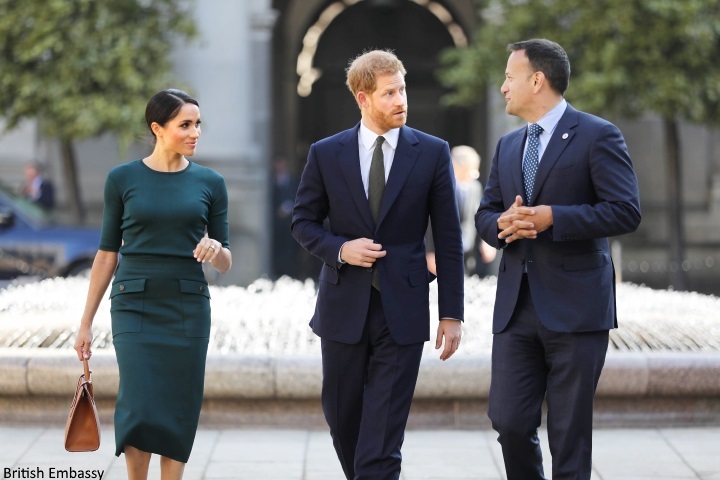 Over the course of the trip, Their Royal Highnesses will meet the people of Dublin and will visit organisations which are central to Irish life." The couple were warmly welcomed upon arrival. The couple were accompanied by an eleven-strong team. Rebecca English reports staff joining them include Harry's private secretary Edward Lane Fox; assistant private secretary, Amy Pickerill; special advisor on foreign issues, Sir David Manning; a four-strong press team including their own social media PR, a programme coordinator, a PA, orderly and a hairdresser. Meghan's hairdresser is George Northwood - he styled her hair for the wedding reception. The couple were deployed by the government to bolster Anglo-Irish relations and strengthen ties as Brexit unfolds. The Irish Times reports: "The Royal visit follows shortly after the successful trip to Cork and Kerry last month by Prince Charles and his wife, Camilla, Duchess of Cornwall. It was the latest in a series of visits to Ireland by Prince Charles. Queen Elizabeth II made the first Royal visit to Ireland by a reigning British monarch in a century in May 2011 - a trip hailed as hugely successful." The arrivals marked the beginning of a new chapter for Meghan as a member of the Royal family - representing Her Majesty overseas. 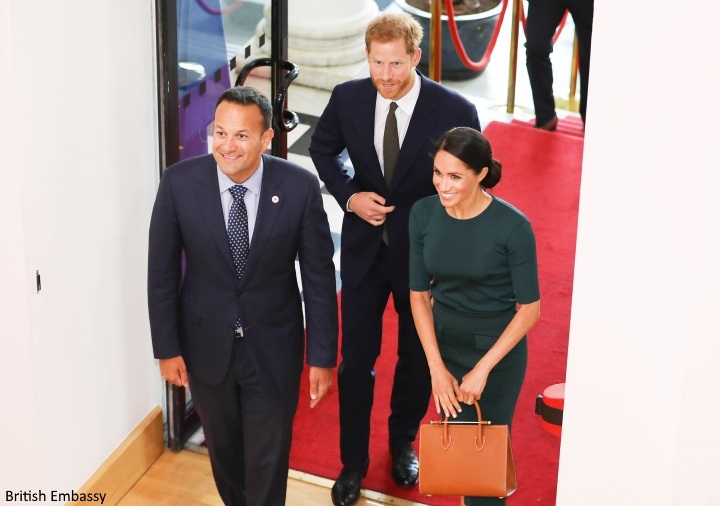 Harry and Meghan's first port of call was Government Buildings where they were welcomed by Taoiseach Leo Varadkar. 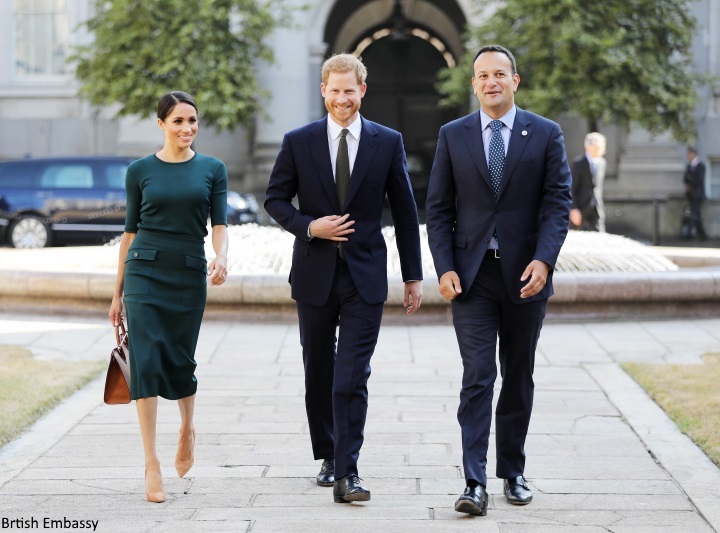 Speaking before the royals arrived, the Taoiseach said: "It is the first visit they will have made overseas since they got married and even though they haven't officially visited Ireland before, I think they are going to be extremely welcome and I look forward to welcoming them. I think with the United Kingdom leaving Europe, we are really going to need to focus a lot more on bilateral relationships and visits of the President to the UK or members of the Royal family to Ireland to help cement that very close relationship between Britain and Ireland." 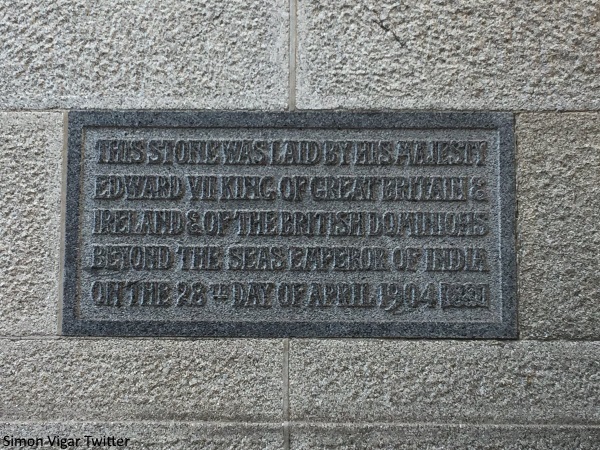 They were shown a plaque laid by Harry's great, great, great grandfather Edward VII. Reporter Kevin Doyle shared the following information: "During their private meeting, Prince Harry suggested that the Irish Defence Forces could participate in the Invictus Games. Prince Harry also raised the issue of housing and homelessness with the Taoiseach. He repeatedly noted how much his father, Charles, likes visiting Ireland." 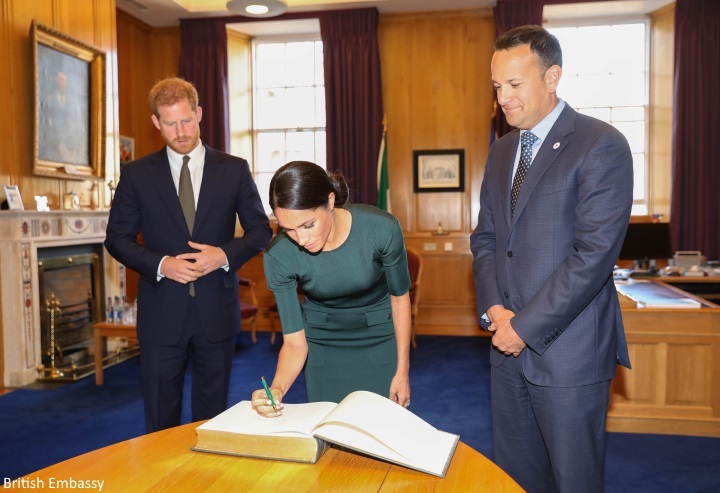 Meghan noted that she's an honorary member of 'the Phil' in Trinity and attended the same Chicago university (Northwestern) where Leo Varadkar's partner Matt works. Meghan was referring to her 2013 visit to Dublin, when she spoke at Trinity College's Philosophical Society, 'the Phil', where she was awarded with the Bram Stoker medal for Entertainment. A video from the couple's meeting with Leo Varadkar. The Duchess very appropriately chose a forest green Givenchy ensemble for her first day in Dublin. The hue was a lovely nod to the host country. We're seeing Meghan turn to her wedding dress designer, Clare Waight Keller, time and time again for important royal events. This look hit all the right notes, taking the Duchess from the airport to Government Buildings. It's a very versatile look. Michelle notes Meghan's skirt is available in red at FarFetch and black at SSENSE. 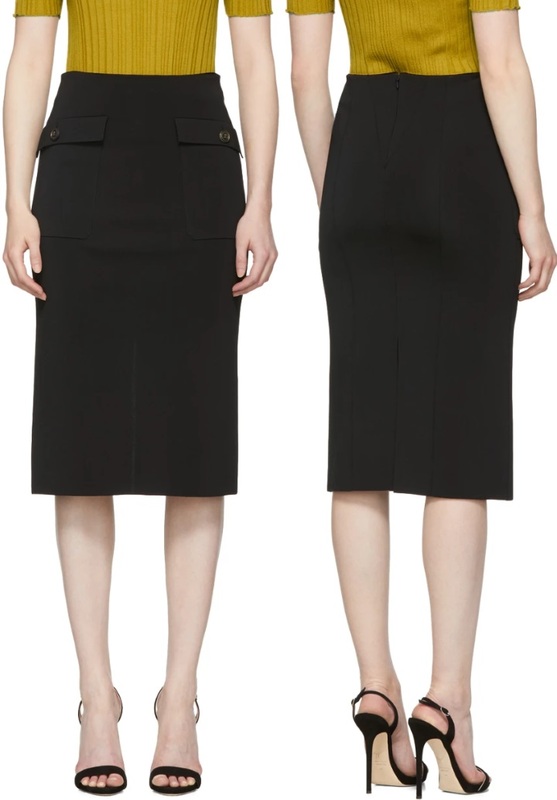 The $1,590 pencil skirt is described as "mid-length knit viscose-blend skirt in black. High-rise. Flap pockets at front. Concealed zip closure, raised seams, and central vent at back. Gold-tone hardware featuring carved logo detailing. Tonal stitching". Meghan's skirt is teamed with a fitted crew neck top. 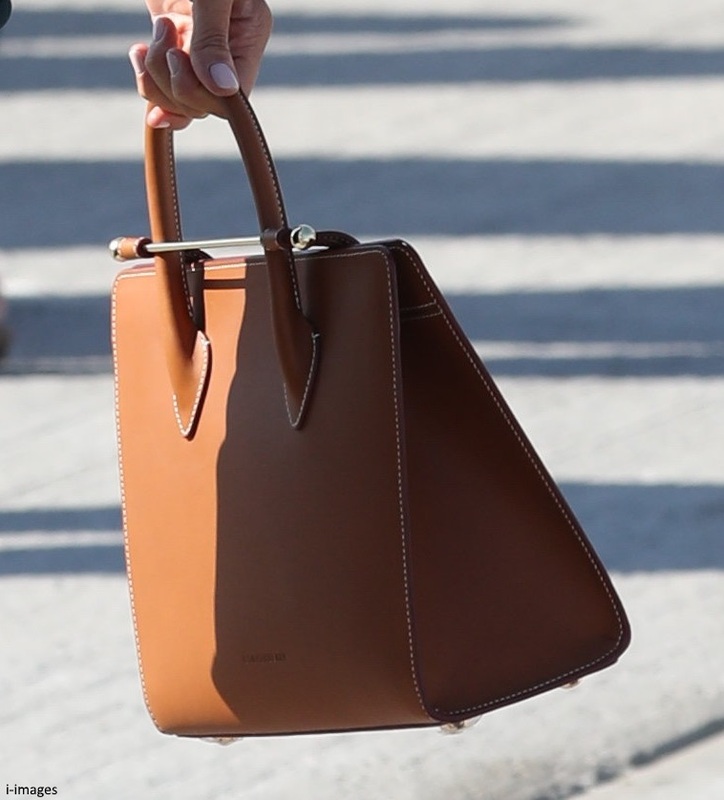 Meghan carried a gorgeous new bag by Strathberry. 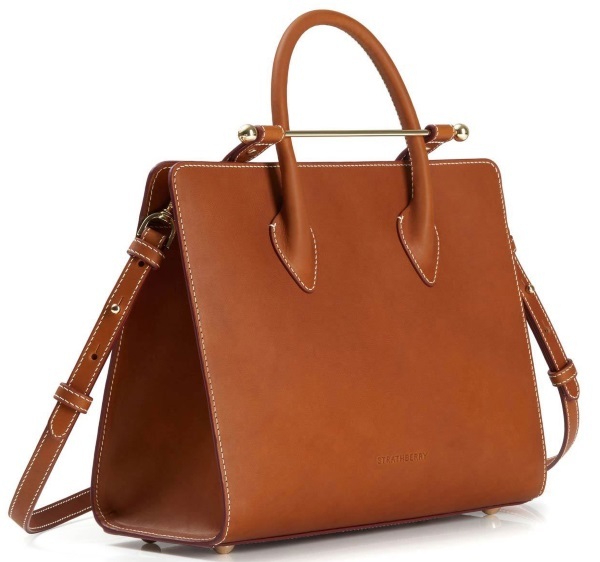 The Midi Tote in Tan Bridle Leather is described: "The Strathberry Midi Tote exudes feminine elegance with its understated styling and iconic Strathberry bar closure. Featuring two interior pockets, Strathberry branded hardware and a detachable and adjustable shoulder strap. Made in Spain using the finest bridle calf leather and microfiber lining with a suede like finish." Meghan's 'tan bridle' is sold out but the almost identical Tan is available. Michelle notes the only difference is Meghan's has visible stitching. The talented Laura identified Meghan's pretty earrings as the Vanessa Tugendhaft Precious with Clover paved diamonds and 18K Pink Gold. And a closer look at Meghan's suede pumps. Next, the couple will attend a summer garden party at the British Ambassador's Residence. Meghan's bag game is the best. She's sticking with the court shoes like Kate, although I do like it when she throws in ankle straps. But another Strathberry bag. This one will probably sell out too and I think this color is much more wearable and functional than the tricolor she carried the first time. I like it a lot. That bag is the best so far, so out of my price range, but heck, it is beautiful. Wish wish wish. I must say the separates she is wearing also great and I love the way she changes it up. I am in love with Harry and Meghan. I enjoy seeing Harry happy and Meghan displaying her support of him and vice versa. The green is pretty and looks great with the beautiful shoes. The little flutter of the end of the skirt below the knees is MM's chosen length and probably looks best on her. I'm sure she has studied all shapes, colors, lengths and chosen the most flattering. What a busy week for you, Charlotte. I do appreciate your wonderful work in providing all the background information. Oh dear, back to the wonderful bags that make me so jealous. I'm happy to see a return to MM's prewedding colors, etc. Separates! I love it. Smart look - exudes confidence IMHO. From the purse to the heels and the structure of the skirt. She's looking very much like a modern Duchess. An incredibly elegant one at that (glad she wore her hair in a bun - windy on the tarmac). Looks like this outfit is a skirt and matching top, not a dress. Very elegant. Her handbag collection is fantastic! Gorgeous bag, I almost thought it was a Kelly bag at first! Just love her confident, modern, fresh, chic yet relatable Duchess style. Can’t help but think how happy Prince Harry is with his new travel companion. I am really going to enjoy watching them visit the Commonwealth countries together. I hope they come to the US sometime soon. Meghan's figure is so lean!! She's gorgeous, I just can't help but stare at those skinny legs! Love these colours on her, especially that Olive green from the christening. I believe we are seeing what a great yoga practice and clean eating will get you, very inspiring! It looks as though she went out the stockings in this arrival shot - doesn't it? The glow of her complexion speaks to healthy eating habits and life style in general. This is PERFECT. I love this look on her, and she makes me so jealous with her Strathberry bags... I want one oh so badly but they are oh so far out of my price range. Haha. But seriously, this looks is so cool, modern, and professional. It fits like a dream, and is the perfect color to honor the host country. Way to go, Meghan! I love the green separates nd just as the other thread was complaining about boatnecks Meghan does a scoopneck! But most of all I LOVE the hair. Love the side-part bun. It's simple, classic, and doesn't look at all stuffy or matronly. I wish she had worn her green shoes that she wore to Louis's christening yesterday they would have gone perfectly with this outfit. I've noticed this several times now: if Meghan is appearing with other members of the BRF she generally goes with a more royal style. If it's just her and Harry doing an engagement she wears stuff she very might well have worn on Suits. 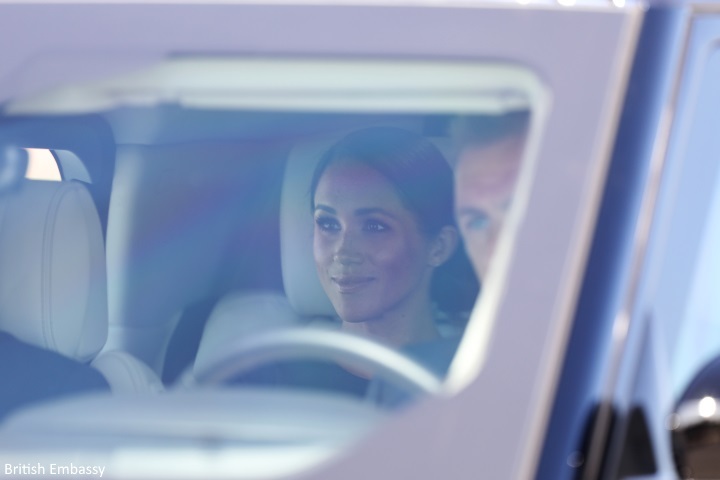 I think it's her way of keeping her identity while still fulfilling her new role as a Duchess. You are right! I think she will keep her very personal style and stretch the boundaries of what Royal women wear, but she's figuring out how to fit in and still be Meghan. These last few days have been super impressive. Love this! Meghan gets it! She dresses appropriately for the occassion. At the previous royal, family events, she went formal, hence the clutch bags, stockings and elegant dresses and hats. Now, she is on a business trip, hence the structured bag and smart separates. I love it! I hope to see more of this distinction, especially when she starts her patronages. Honest, while I love Kate's regalness, I wouldn't mind seeing this distinction from her as well. But, I just don't think that is her style. Meghan has worked in the real world longer and so, she has that frame of reference, just like Queen Letizia. Bingo! You could not have said it better. I hope royal watchers hear your words. Great change; nicely done for the Duchess of Sussex. Also, great job Charlotte keeping up with ALL the happenings yesterday and today on both the Duchess of Sussex and the Duchess of Cambridge. I’m staying focused for more info. 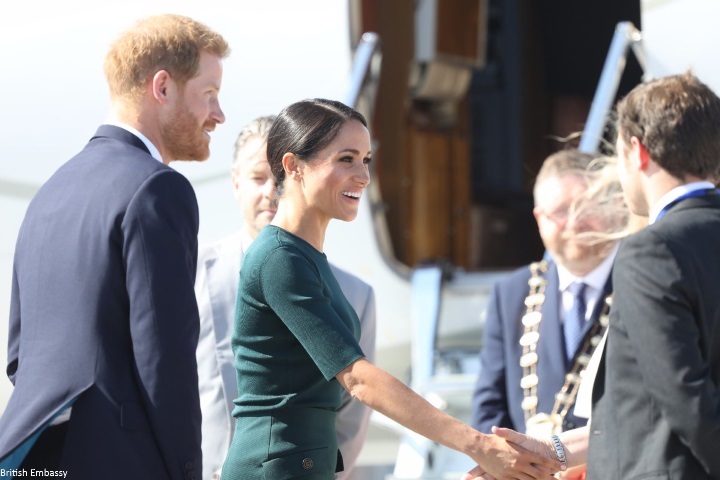 In video: Great job with remembering official protocol, the Duchess of Sussex waited for Prince Harry to initiate the handshakes although she was given the opportunity for the go ahead. Nice! Just when I thought today's fashion couldn't get any better Meghan hits us with this lovely creation! It seems as though she can just about any shade of green and the tan accessories are perfect! As I"m still swooning over this morning's outfit I don't have a ton to add but will be back later to see what she wears to the garden party. Very smart as ever! The duchess's one colour approach really does work every time! Amazing, I love this look, it’s simple, flattering and elegant. I love that she’s wearing separates, IMO that’s when she showcases her truly modern style. Couldn’t be better. Makes me excited to see what she wears in the next few days. I love it when she doesn’t dress like any of the other ladies in the royal family. Wonderful outfit. She looks very polished. I have noticed that her wisps of hair around her face are now for the most part either long enough to be tied back in her bun or ponytail or sprayed/pinned down. I suspect we will see those wisps for some outings but she may have decided on engagements that last several hours and involve meeting people that they were too distracting. I might be completely wrong, so will be fun to see a few more outings. Charlotte, just wanted to thank you for all your wonderful blogs. I know you've been busy these past few days! I was curious about something. Do you think we might see Kate and Meghan together without their husbands someday? I'd love to see the ladies work together on a cause close to their hearts. They look like they get along well, and as W&H are so close, I hope their wives become good friends, too. Oh gosh, she looks exquisite! Bring it on Duchess, bring it on! How does she manage such poise with the wind blowing from everywhere? Go Meghan! While she's never "missed" in terms of style, right now she is on a five-star outfit streak IMO, beginning with the bright yellow Brandon Maxwell sheath dress. I agree - I absolutely love everything that she wears. She obviously loves fashion and is not afraid to embrace it! Love the color. Love the side part on her hair. Not a fan of the flap pockets on the skirt, but it’s a minor thing. She looks great. I love that she is embracing and showing off her figure. I suspect that before she used clothing to hide her shape. She looks amazing and her clothing reflects her confidence! ...Have you ever seen “Suits?” Not a lot of shape-hiding going on with that wardrobe. A $1590 skirt. I would make an awful royal, shopping only the sales. Hee hee, that is why you have to have a stylist to just send you the stuff:):). Love how she looks here, it’s smart without being too formal. I hope she wears some Irish designers, at some stage. 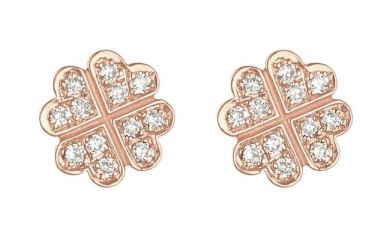 And beautiful "four-leaf clover" earrings! I am not typically a fan of Rose Gold but those are nice earrings and look good for being a much done symbol. Can't believe anyone could actually make them out in the photos. Yes, love this, as well! The dark green is a wonderful color for her and is an appropriate nod to the country. Love the side pockets and the fit! A wonderful, polished look! The four leaf clover/shamrock earrings are a lovely addition to her choice of green for today's fashion diplomacy statement. Perfect work clothing, not fussy but classic and tailored. Meghan always hits the mark. Love the bag! Wow well done today, Meghan! Now let's add a little necklace action- I think you've earned a trip to the jeweler this week! I adore that she wears skirts and tops and dresses. A little shake up is refreshing. It’s professional and welcoming and I think she manages to hit the right notes with her choices. Love the color of her outfit. Love her side part! Finally!!! Lovely but needed a brooch, or just a wee something to take away the "office-y" look. Love this colour! Drooling over this new bag. She truly has an enviable bag collection. Her hat game is super strong lately as well. Love the clover shaped earrings, subtly “Irish themed”. I do think the whole outfit is a bit “fall” again, but it is lovely nonetheless. What a great visit! I especially love Meghan's earrings, and the skirt, wow! I want this skirt in every colour, so versatile and beautiful tailoring. WAY out of my price range unfortunately. I look forward to seeing more about this visit. Meghan and Harry look happy, they really suit (no pun intended) these sort of trips and visits. Another hit for me. This woman knows her style, and what she likes. The look is fabulous. Love the color with her bag and shoes. She really knows how to put together an outfit. Always tasteful and elegant. I love Meghan and Harry! I love this two piece outfit, and the color is perfect. It fits her perfectly, and the bag is to die for. They look terrific together. This is a pretty outfit and green really suits her! If I could afford it I would buy it! Stunning, love the side part and caramel shoes and bag. Just beautiful. Bronwyn, Sydney.